Other religions (most notably Hinduism and Jainism) hold that all living things from the smallest bacterium to the largest of mammals are the souls themselves (Atman, jiva) and have their physical representative (the body) in the world. The actual self is the soul, while the body is only a mechanism to experience the karma of that life. Thus if we see a tiger then there is a self-conscious identity residing in it (the soul), and a physical representative (the whole body of the tiger, which is observable) in the world. Some teach that even non-biological entities (such as rivers and mountains) possess souls. This belief is called animism. 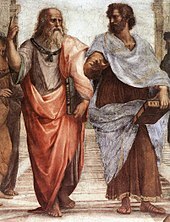 Greek philosophers, such as Socrates, Plato, and Aristotle, understood that the soul (ψυχή psūchê) must have a logical faculty, the exercise of which was the most divine of human actions. At his defense trial, Socrates even summarized his teaching as nothing other than an exhortation for his fellow Athenians to excel in matters of the psyche since all bodily goods are dependent on such excellence (Apology 30a–b). The current consensus of modern science is that there is no evidence to support the existence of the soul when traditionally defined as the spiritual breath of the body. In metaphysics, the concept of "Soul" may be equated with that of "Mind" in order to refer to the consciousness and intellect of the individual. The Modern English word "soul", derived from Old English sáwol, sáwel, was first attested in the 8th century poem Beowulf v. 2820 and in the Vespasian Psalter 77.50 . It is cognate with other German and Baltic terms for the same idea, including Gothic saiwala, Old High German sêula, sêla, Old Saxon sêola, Old Low Franconian sêla, sîla, Old Norse sála and Lithuanian siela. Deeper etymology of the Germanic word is unclear. The original concept behind the Germanic root is thought to mean “coming from or belonging to the sea (or lake)”, because of the Germanic and pre-Celtic belief in souls emerging from and returning to sacred lakes, Old Saxon sêola (soul) compared to Old Saxon sêo (sea). In the ancient Egyptian religion, an individual was believed to be made up of various elements, some physical and some spiritual. Similar ideas are found in ancient Assyrian and Babylonian religion. Kuttamuwa, an 8th-century BCE royal official from Sam'al, ordered an inscribed stele erected upon his death. 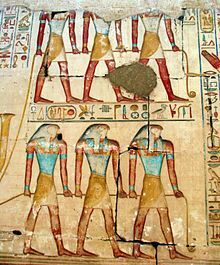 The inscription requested that his mourners commemorate his life and his afterlife with feasts "for my soul that is in this stele". It is one of the earliest references to a soul as a separate entity from the body. The 800-pound (360 kg) basalt stele is 3 ft (0.91 m) tall and 2 ft (0.61 m) wide. It was uncovered in the third season of excavations by the Neubauer Expedition of the Oriental Institute in Chicago, Illinois. And they ask you, [O Muhammad], about the Rûh. Say, "The Rûh is of the affair of my Lord. And mankind has not been given of knowledge except a little. The Hebrew terms נפש nefesh (literally "living being"), רוח ruach (literally "wind"), נשמה neshamah (literally "breath"), חיה chayah (literally "life") and יחידה yechidah (literally "singularity") are used to describe the soul or spirit. Charon (Greek) who guides dead souls to the Underworld. 4th century BCE. 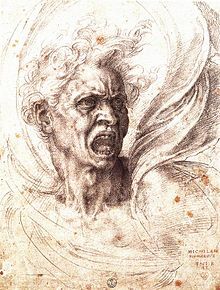 Aristotle (384–322 BCE) defined the soul, or Psūchê (ψυχή), as the "first actuality" of a naturally organized body, and argued against its separate existence from the physical body. In Aristotle's view, the primary activity, or full actualization, of a living thing constitutes its soul. For example, the full actualization of an eye, as an independent organism, is to see (its purpose or final cause). Another example is that the full actualization of a human being would be living a fully functional human life in accordance with reason (which he considered to be a faculty unique to humanity). For Aristotle, the soul is the organization of the form and matter of a natural being which allows it to strive for its full actualization. This organization between form and matter is necessary for any activity, or functionality, to be possible in a natural being. Using an artifact (non-natural being) as an example, a house is a building for human habituation, but for a house to be actualized requires the material (wood, nails, bricks, etc.) necessary for its actuality (i.e. being a fully functional house). However, this does not imply that a house has a soul. In regards to artifacts, the source of motion that is required for their full actualization is outside of themselves (for example, a builder builds a house). In natural beings, this source of motion is contained within the being itself. Aristotle elaborates on this point when he addresses the faculties of the soul. 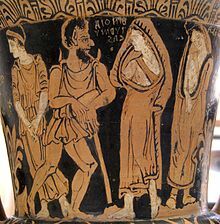 Aristotle identified three hierarchical levels of natural beings: plants, animals, and people, having three different degrees of soul: Bios (life), Zoë (animate life), and Psuchë (self-conscious life). 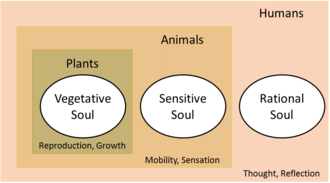 For these groups, he identified three corresponding levels of soul, or biological activity: the nutritive activity of growth, sustenance and reproduction which all life shares (Bios); the self-willed motive activity and sensory faculties, which only animals and people have in common (Zoë); and finally "reason", of which people alone are capable (Pseuchë). Aristotle's discussion of the soul is in his work, De Anima (On the Soul). Although mostly seen as opposing Plato in regard to the immortality of the soul, a controversy can be found in relation to the fifth chapter of the third book: In this text both interpretations can be argued for, soul as a whole can be deemed mortal, and a part called "active intellect" or "active mind" is immortal and eternal. Advocates exist for both sides of the controversy, but it has been understood that there will be permanent disagreement about its final conclusions, as no other Aristotelian text contains this specific point, and this part of De Anima is obscure. Further, Aristotle states that the soul helps humans find the truth and understanding the true purpose or role of the soul is extremely difficult. Following Aristotle, Avicenna (Ibn Sina) and Ibn al-Nafis, an Arab physician, further elaborated upon the Aristotelian understanding of the soul and developed their own theories on the soul. They both made a distinction between the soul and the spirit, and the Avicennian doctrine on the nature of the soul was influential among the Scholastics. Some of Avicenna's views on the soul include the idea that the immortality of the soul is a consequence of its nature, and not a purpose for it to fulfill. In his theory of "The Ten Intellects", he viewed the human soul as the tenth and final intellect. Following Aristotle (whom he referred to as "the Philosopher") and Avicenna, Thomas Aquinas (1225–74) understood the soul to be the first actuality of the living body. Consequent to this, he distinguished three orders of life: plants, which feed and grow; animals, which add sensation to the operations of plants; and humans, which add intellect to the operations of animals. The current scientific consensus across all fields is that there is no evidence for the existence of any kind of soul in the traditional sense. Many modern scientists, such as Julien Musolino, hold that the mind is merely a complex machine that operates on the same physical laws as all other objects in the universe. According to Musolino, there is currently no scientific evidence whatsoever to support the existence of the soul; he claims there is also considerable evidence that seems to indicate that souls do not exist. Physicist Sean M. Carroll has written that the idea of a soul is incompatible with quantum field theory (QFT). He writes that for a soul to exist: "Not only is new physics required, but dramatically new physics. Within QFT, there can't be a new collection of 'spirit particles' and 'spirit forces' that interact with our regular atoms, because we would have detected them in existing experiments." ^ "soul. "Encyclopædia Britannica. 2010. Encyclopædia Britannica 2006 CD. 13 July 2010. ^ "Soul (noun)". Oxford English Dictionary (OED) online edition. Oxford English Dictionary (OED). Retrieved 1 December 2016. ^ "Immortality of the Soul". www.jewishencyclopedia.com. Archived from the original on 20 December 2016. Retrieved 14 December 2016. ^ "Soul", The Columbia Encyclopedia, Sixth Edition. 2001–07. Retrieved 12 November 2008. ^ "Found: An Ancient Monument to the Soul". The New York Times. 17 November 2008. Archived from the original on 24 April 2009. Retrieved 18 November 2008. In a mountainous kingdom in what is now southeastern Turkey, there lived in the eighth century B.C. a royal official, Kuttamuwa, who oversaw the completion of an inscribed stone monument, or stele, to be erected upon his death. The words instructed mourners to commemorate his life and afterlife with feasts "for my soul that is in this stele." ^ Bahá'u'lláh (1976). Gleanings from the Writings of Bahá'u'lláh. Wilmette, Illinois: Bahá'í Publishing Trust. pp. 158–63. ISBN 978-0-87743-187-9. Archived from the original on 3 March 2016. Retrieved 23 February 2016. ^ Bahá'u'lláh (1976). Gleanings from the Writings of Bahá'u'lláh. Wilmette, Illinois: Bahá'í Publishing Trust. pp. 155–58. ISBN 978-0-87743-187-9. Archived from the original on 4 March 2016. Retrieved 23 February 2016. ^ a b Taherzadeh, Adib (1976). The Revelation of Bahá'u'lláh, Volume 1. Oxford: George Ronald. ISBN 978-0-85398-270-8. Archived from the original on 3 March 2016. Retrieved 23 February 2016. ^ Conze, Edward (1993). A Short History of Buddhism. Oneworld. p. 14. ISBN 978-1-85168-066-5. ^ "六朝神滅不滅論與佛教輪迴主體之研究". Ccbs.ntu.edu.tw. Archived from the original on 13 March 2012. Retrieved 13 November 2011. ^ "佛教心理論之發達觀". Ccbs.ntu.edu.tw. Archived from the original on 13 March 2012. Retrieved 13 November 2011. ^ "植物、草木、山石是无情众生吗？有佛性吗？". Bskk.com. Archived from the original on 9 October 2011. Retrieved 13 November 2011. ^ "從律典探索佛教對動物的態度（中）". Awker.com. Archived from the original on 2011-11-21. Retrieved 13 November 2011. ^ "無情眾生現今是不具有神識，但具有佛性！". Dharma.com.tw. Archived from the original on 30 December 2011. Retrieved 13 November 2011. ^ B. Alan Wallace, Contemplative Science. University of Columbia Press, 2007, p. 13. ^ Smith, Joseph (1981). Doctrine and Covenants. Salt Lake City, Utah: The Church of Jesus Christ of Latter-Day Saints. p. 286. ISBN 978-1-59297-503-7. ^ "Soul". newadvent.org. 1 July 1912. Archived from the original on 28 November 2011. Retrieved 13 November 2011. ^ ""Do Embryos Have Souls? ", Father Tadeusz Pacholczyk, PhD, Catholic Education Resource Center". Catholiceducation.org. Archived from the original on 29 June 2011. Retrieved 13 November 2011. ^ Matthew Syed (12 May 2008). "Embryos have souls? What nonsense". The Times. UK. Archived from the original on 18 September 2011. Retrieved 13 November 2011. ^ "Catechism of the Catholic Church, paragraph 363". Vatican.va. Archived from the original on 16 November 2011. Retrieved 13 November 2011. ^ "Catechism of the Catholic Church, paragraph 382". Vatican.va. Archived from the original on 16 November 2011. Retrieved 13 November 2011. ^ Paul Helm, John Calvin's Ideas 2006 p. 129 "The Immortality of the Soul: As we saw when discussing Calvin's Christology, Calvin is a substance dualist." ^ Anthony Grafton, Glenn W. Most, Salvatore Settis The Classical Tradition 2010 p. 480 "On several occasions, Luther mentioned contemptuously that the Council Fathers had decreed the soul immortal." ^ Richard Marius Martin Luther: the Christian between God and death 1999 p. 429 "Luther, believing in soul sleep at death, held here that in the moment of resurrection... the righteous will rise to meet Christ in the air, the ungodly will remain on earth for judgment,..."
^ "Do You Have an Immortal Soul?". The Watchtower: 3–5. 15 July 2007. Archived from the original on 31 December 2014. ^ What Does the Bible Really Teach?. p. 211. ^ "Moses 6:51". lds.org. Archived from the original on 12 March 2016. Retrieved 23 February 2016. ^ "Hebrews 12:9". lds.org. Archived from the original on 3 March 2016. Retrieved 23 February 2016. ^ "Spirit." Guide to the Scriptures "Spirit". Archived from the original on 8 April 2014. Retrieved 7 April 2014. ^ "Gospel Principles Chapter 41: The Postmortal Spirit World". lds.org. Archived from the original on 4 March 2016. Retrieved 23 February 2016. [c] WJ Johnson (2009), A Dictionary of Hinduism, Oxford University Press, ISBN 978-0-19-861025-0, See entry for Atman (self). ^ a b David Lorenzen (2004), The Hindu World (Editors: Sushil Mittal and Gene Thursby), Routledge, ISBN 0-415-21527-7, pp. 208–09, Quote: "Advaita and nirguni movements, on the other hand, stress an interior mysticism in which the devotee seeks to discover the identity of individual soul (atman) with the universal ground of being (brahman) or to find god within himself". ^ Chad Meister (2010), The Oxford Handbook of Religious Diversity, Oxford University Press, ISBN 978-0-19-534013-6, p. 63; Quote: "Even though Buddhism explicitly rejected the Hindu ideas of Atman (“soul”) and Brahman, Hinduism treats Sakyamuni Buddha as one of the ten avatars of Vishnu." ^ Deussen, Paul and Geden, A.S. The Philosophy of the Upanishads. Cosimo Classics (June 1, 2010). p. 86. ISBN 1-61640-240-7. ^ Richard King (1995), Early Advaita Vedanta and Buddhism, State University of New York Press, ISBN 978-0-7914-2513-8, p. 64, Quote: "Atman as the innermost essence or soul of man, and Brahman as the innermost essence and support of the universe. (...) Thus we can see in the Upanishads, a tendency towards a convergence of microcosm and macrocosm, culminating in the equating of atman with Brahman". ^ Matthew Hall (2011). Plants as Persons: A Philosophical Botany. State University of New York Press. p. 76. ISBN 978-1-4384-3430-8. ^ a b J Jaini (1940). Outlines Of Jainism. Cambridge University Press. pp. xxii–xxiii. ^ Sarao, K.T.S. ; Long, Jeffery D., eds. (2017). "Jīva (Jainism)". Buddhism and Jainism. Encyclopedia of Indian Religions. Springer Netherlands. p. 594. doi:10.1007/978-94-024-0852-2_100397. ISBN 978-94-024-0851-5. ^ a b Jean Varenne (1989). Yoga and the Hindu Tradition. Motilal Banarsidass. pp. 45–47. ISBN 978-81-208-0543-9. ^ Michael Myers (2013). Brahman: A Comparative Theology. Routledge. pp. 140–43. ISBN 978-1-136-83565-0. ^ Deuraseh, Nurdeen; Abu Talib, Mansor (2005). "Mental health in Islamic medical tradition". The International Medical Journal. 4 (2): 76–79. ^ Bragazzi, NL; Khabbache, H (2018). "Neurotheology of Islam and Higher Consciousness States". Cosmos and History: The Journal of Natural and Social Philosophy. 14 (2): 315–21. ^ Ahmad, Sultan (2011). "Nafs: What Is it?". Islam In Perspective (revised ed.). Author House. p. 180. ISBN 978-1-4490-3993-6. Retrieved 2017-07-15 – via Google Books. ^ "Forgotten Gandhi, Virchand Gandhi (1864–1901) – Advocate of Universal Brotherhood". All Famous Quotes. Archived from the original on 21 September 2013. ^ The only person mentioned in the Torah celebrating birthday (party) is the wicked pharaoh of Egypt Genesis 40:20–22. ^ HaQoton, Reb Chaim (17 April 2007). "Happy Birthday". Reb Chaim HaQoton. Archived from the original on 9 November 2013. Retrieved 11 July 2013. ^ "About Jewish Birthdays". Judaism 101. Aish.com. Archived from the original on 22 August 2013. Retrieved 11 July 2013. ^ "Soul". jewishencyclopedia.com. Archived from the original on 8 March 2016. ^ Pope, Hugh (2006) . Sons of the conquerors: the rise of the Turkic world. New York: Overlook Duckworth. p. 270. ISBN 978-1-58567-804-4. ^ SGGS, M 1, p. 1153. ^ SGGS, M 4, p. 1325. ^ SGGS, M 1, p. 1030. ^ "Encyclopedia of Death and Dying (2008)". Deathreference.com. Archived from the original on 5 November 2011. Retrieved 13 November 2011. ^ Ginzberg, Louis (1909). The Legends of the Jews Vol I, Chapter II: Adam Archived 1 December 2017 at the Wayback Machine (Translated by Henrietta Szold) Philadelphia: Jewish Publication Society. ^ Ginzberg, Louis (1909). The Legends of the Jews Vol I, Chapter II: The Soul of Man Archived 1 December 2017 at the Wayback Machine (Translated by Henrietta Szold) Philadelphia: Jewish Publication Society. ^ Ramsay, Tamasin (Sep 2010). "Custodians of Purity An Ethnography of the Brahma Kumaris". Monash University: 105. ^ Creeger, Rudolf Steiner; translated by Catherine E. (1994). Theosophy: an introduction to the spiritual processes in human life and in the cosmos (3rd ed.). Hudson, NY: Anthroposophic Press. pp. 42–46. ISBN 978-0-88010-373-2. ^ Baba, Meher. (1987). Discourses. Myrtle Beach, SC: Sheriar Press. p. 222. ISBN 978-1-880619-09-4. ^ Lorenz, Hendrik (2009). Zalta, Edward N., ed. The Stanford Encyclopedia of Philosophy (Summer 2009 ed.). Metaphysics Research Lab, Stanford University. ^ Francis M. Cornford, Greek Religious Thought, p. 64, referring to Pindar, Fragment 131. ^ Erwin Rohde, Psyche, 1928. ^ Jones, David (2009). The Gift of Logos: Essays in Continental Philosophy. Cambridge Scholars Publishing. pp. 33–35. ISBN 978-1-4438-1825-4. Retrieved 2016-02-23. ^ Aristotle. On The Soul. p. 412b5. ^ Aristotle. Physics. Book VIII, Chapter 5, pp. 256a5–22. ^ Aristotle. Nicomachean Ethics. Book I, Chapter 7, pp. 1098a7–17. ^ Aristotle. Physics. Book III, Chapter 1, pp. 201a10–25. ^ Aristotle. On The Soul. Book III, Chapter 5, pp. 430a24–25. ^ Shields, Christopher (2011). "supplement: The Active Mind of De Anima iii 5)". Aristotle's Psychology. The Stanford Encyclopedia of Philosophy. Retrieved 12 December 2013. ^ Smith, J. S. (Trans) (1973). Introduction to Aristotle. Chicago: University of Chicago Press. pp. 155–59. ^ "Floating Man – The Art and Popular Culture Encyclopedia". www.artandpopularculture.com. Archived from the original on 26 April 2018. Retrieved 25 April 2018. ^ Seyyed Hossein Nasr and Oliver Leaman (1996), History of Islamic Philosophy, p. 315, Routledge, ISBN 0-415-13159-6. ^ Nahyan A.G. Fancy (2006). "Pulmonary Transit and Bodily Resurrection: The Interaction of Medicine, Philosophy and Religion in the Works of Ibn al-Nafīs (d. 1288)"". Electronic Theses and Dissertations, University of Notre Dame. pp. 209–10. Archived from the original on 4 April 2015. ^ Aquinas, Thomas. "Quaestiones Disputatae de Veritate" (in Latin). Archived from the original on 4 March 2016. Retrieved 23 February 2016. ^ Aquinas, Thomas. "Super Boetium De Trinitate" (in Latin). Archived from the original on 4 March 2016. Retrieved 23 February 2016. ^ Bishop, Paul (2000). Synchronicity and Intellectual Intuition in Kant, Swedenborg, and Jung. US: The Edwin Mellen Press. pp. 262–67. ISBN 978-0-7734-7593-9. ^ Ryles, Gilbert (1949). The Concept of Mind. University Of Chicago Press. ^ Hillman J (T Moore, Ed.) (1989). A blue fire: Selected writings by James Hillman. New York: HarperPerennial. p. 21. ^ Hillman J (T Moore, Ed.) (1989). A blue fire: Selected writings by James Hillman. New York: HarperPerennial. p. 112. ^ Hillman J (T Moore, Ed.) (1989). A blue fire: Selected writings by James Hillman. New York: HarperPerennial. p. 121. ^ a b c Musolino, Julien (2015). The Soul Fallacy: What Science Shows We Gain from Letting Go of Our Soul Beliefs. Amherst, New York: Prometheus Books. pp. 21–38. ISBN 978-1-61614-962-8. ^ O. Carter Snead. "Cognitive Neuroscience and the Future of Punishment Archived 5 November 2014 at the Wayback Machine" (2010). ^ Kandel, ER; Schwartz JH; Jessell TM; Siegelbaum SA; Hudspeth AJ. "Principles of Neural Science, Fifth Edition" (2012). ^ Andrea Eugenio Cavanna, Andrea Nani, Hal Blumenfeld, Steven Laureys. "Neuroimaging of Consciousness" (2013). ^ Farah, Martha J.; Murphy, Nancey (February 2009). "Neuroscience and the Soul". Science. 323 (5918): 1168. doi:10.1126/science.323.5918.1168a. PMID 19251609. ^ Max Velmans, Susan Schneider. "The Blackwell Companion to Consciousness" (2008). p. 560. ^ Matt Carter, Jennifer C. Shieh. "Guide to Research Techniques in Neuroscience" (2009). ^ Squire, L. et al. "Fundamental Neuroscience, 4th edition" (2012). Chapter 43. ^ Carroll, Sean M.. (2011). "Physics and the Immortality of the Soul" Archived 6 October 2011 at the Wayback Machine. Scientific American. Retrieved 2014-10-11. ^ Clarke, Peter. (2014). Neuroscience, Quantum Indeterminism and the Cartesian Soul Archived 10 September 2017 at the Wayback Machine. Brain and cognition 84: 109–17. ^ Milbourne Christopher. (1979). Search for the Soul: An Insider's Report on the Continuing Quest by Psychics and Scientists for Evidence of Life After Death. Thomas Y. Crowell, Publishers. ^ MacDougall, Duncan (1907). "The Soul: Hypothesis Concerning Soul Substance Together with Experimental Evidence of the Existence of Such Substance". American Medicine. New Series. 2: 240–43. ^ "How much does the soul weights?". Archived from the original on 28 April 2016. Bremmer, Jan (1983). The Early Greek Concept of the Soul (PDF). Princeton: Princeton University Press. ISBN 978-0-691-03131-6. Retrieved 16 August 2007. Clarke, Peter (2014). "Neuroscience, Quantum Indeterminism and the Cartesian Soul". Brain and Cognition. 84 (1): 109–17. doi:10.1016/j.bandc.2013.11.008. PMID 24355546. Herbermann, Charles, ed. (1913). "Soul" . Catholic Encyclopedia. New York: Robert Appleton Company. This page was last edited on 14 April 2019, at 10:41 (UTC).